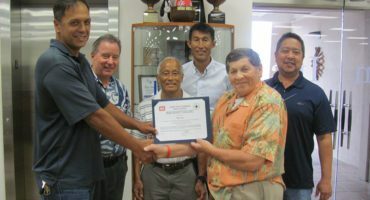 Nan Inc Earns Safety Excellence Award from US Army Corps | | Nan, Inc.
Pictured from left to right: Keanu Kuna, Deane Shephard, Randy Mita, Nan Shin, Jeff Cochran and Frank Okimoto. Nan, Inc. is proud to have received a hard-earned award from the US Army Corps of Engineers for its work to complete the Fort Shafter Flats Flood Mitigation project. Nan, Inc. accrued 95,200 man-hours with no lost time or recordable accidents. 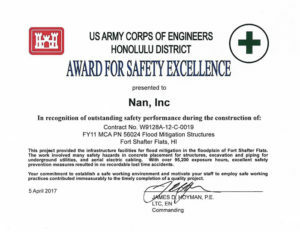 In recognition of this accomplishment, the US Army Corps of Engineers Honolulu District presented Nan, Inc. with its Award for Safety Excellence on June 15, 2017. The $21 million project focused on improving the flood-prone Fort Shafter Flats area so it can better withstand a 10 year flood event. The work included bridge modification, relocating underground storm drain lines and also new storm drainage detention. Nan, Inc. also constructed a drainage pump station, a generator building and an information systems structure. This project, like most in construction had its share of challenges. The biggest being a year-long pause while the Army resolved land easement issues with the state of Hawaii. After the break, Nan, Inc. seamlessly finished the work and kept its impeccable safety record intact. In addition to the safety award, the Army Corps gave Nan, Inc. an overall rating of Exceptional for this project. Nan, Inc. is proud to have exceeded our client’s high expectations, while simultaneously achieving a great milestone in safety.